With dedicated meeting rooms, high-speed WiFi, free on-site parking and a reception, this well-located centre is perfect for your business. The receptionist at the centre is happy to assist with clerical services and greet any visitors. This property is within a five-minute walk of cafes, restaurants and shops and just eight-minutes from Cambridge railway station. The historic city centre is less than a 20-minute walk. 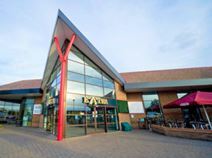 Located at a service station in Cambridge, just off the A14 and M11, this is a perfect location for those on the road. With natural light shining through the office space in the business lounge, free refreshments and meeting rooms available for hire, this space is ideal if you're looking for the modern business environment. With plenty of shops, restaurants and cafes available on site as well, this office space is a great base for any aspiring business. Located on the outskirts of Cambridge City Centre, this centre has a serene garden setting. The brick building has excellent views and is easily accessible from the M11 motorway. Offices of a variety of sizes are available to suit any small or medium business. The offices are fully serviced and fully furnished to the tenant’s needs when they move in. The centre is located in a business park complete with local shops and amenities. In the heart of the historic city of Cambridge, this prominent office block provides a contemporary reception area and board room and recently refurbished office suites of a high standard. The glass exterior of the building gives ample natural lighting and an excellent view, while the interior is warm with wooden features, artwork and a natural décor. The local amenities are abundant and wide-ranging, and regular train services to the local station make this location very accessible. With an ideal location less than a minutes walk from Cambridge train station, this business centre provides superb flexible office space in the centre of the city. A full range of amenities is available, and spaces are light and comfortable. The city centre provides a range of attractions, including some great places to grab a bite to eat, lots of bars and some excellent shops. There are hotels located across the city.